Let me start out by saying a few things about this experience. 1) Be Flexible! 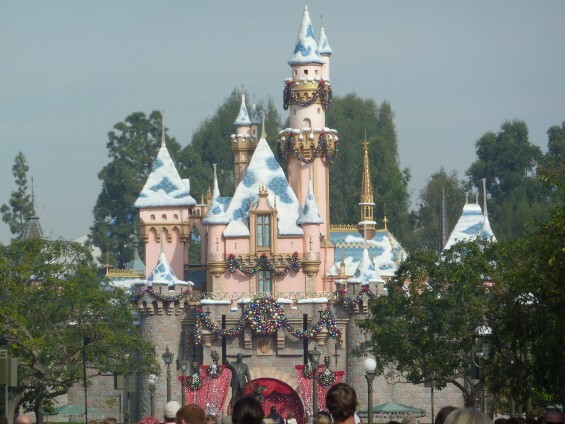 I actually hadn’t planned on spending three consecutive days at Disneyland – as hard as that may be for some of you to believe… Once I found out the schedule of events, it became evident that what I had experienced in the past was not what was happening this year and I had to become flexible to get the experience I wanted. 2) Be prepared for Disney Cast Members to not give you all the schedule information you want or even have conflicting information. They aren’t trying to mislead you – some honestly don’t know or are guessing. Don’t be angry – there is a good reason for this happening – and it is all common sense. Not all Cast Members are told what’s happening for security purposes. If they do know, some of it may be confidential. The ones dressed in daily costumes will know the least – the ones in black or suits, the most. 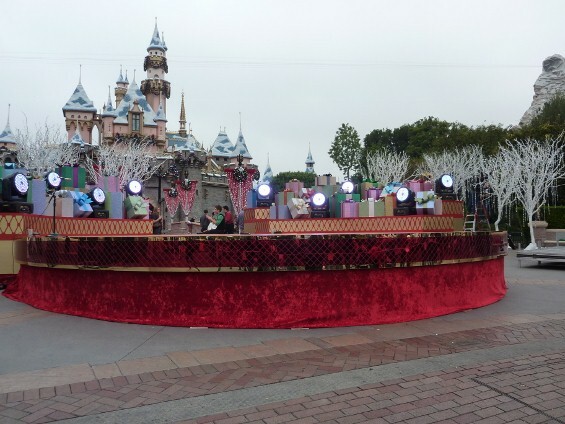 Think about how crazy last year’s taping would have been, had word gotten out that the Jonas Brothers were performing in front of the castle at 8:30am…. 3) Watching parade taping is not necessarily a family event. You need to consider one important thing – Hollywood is not glamourous. This literally takes ALL DAY. If there is a celebrity that your kids want to see, you need patience, a game plan, and a back-up plan. Seriously. You also need to prepare for your children’s needs – food, water, etc.. If you don’t, you are placing demands on them that they will not be able to handle. When you choose your seats, take a moment to consider where the closest food vendors and restrooms are on your side of the street! This will be critical in maintaining your family’s needs. I saw too many families have to abandon their plans and leave because their children were having heat/food issues. There were also folks not understanding that. 4) Your children will get bored. We learned that lesson with our experience last year. Once you get your spot – tag team to take the kids on rides while one person saves the spot. Just make sure you let the folks around you know that you have family that is coming back, so they make room. This being said, we dressed up in our red holiday shirts and Snowflake Santa Mickey ears (much like we did last year), and headed to the park at opening time. In the parking lot, we saw small dancers and their families. This fueled our excitement. We saw others with their Santa ears – they were in the know, as we were, but most guests didn’t know what would be in store for them that weekend. We knew what to look for. 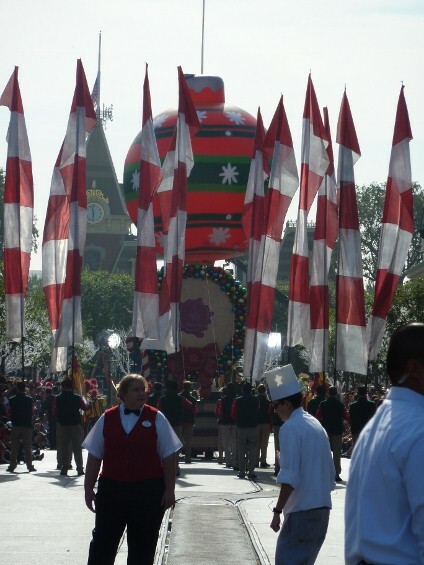 We thought we would see celebrity performances, floats, and the like when we entered the gates that morning. 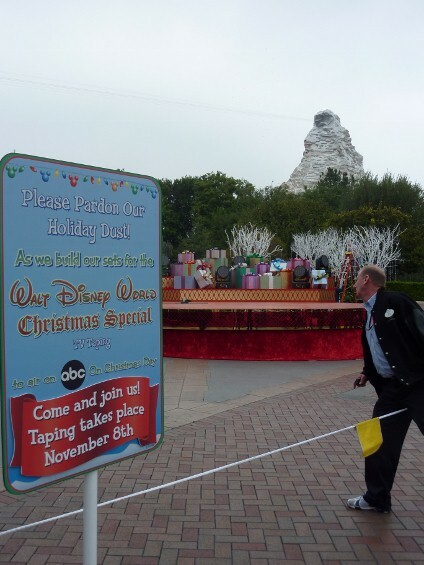 As we walked under the railroad berm, all the signs of parade taping were there, camera stations, and even the flocked winter trees that hide the natural ficus, but there was an empty spot where the Christmas Tree normally sits. Where was the parade host grandstand!?!? We were a touch confused! We then met up with the DISBoards Disneyland Moderator, Mary Jo, who informed us that there was going to be a bit of a change in plans for the day. Instead we were greeted by a sign at the castle indicating that the celebrity performance was on Sunday, and with further inquiries into the management staff guarding the area, we found that floats would also not be that day. Now here is the place where most folks would walk away with the info they were given. Not me. I’m too curious. Or maybe persistent. Either way, I wanted to see what unique offerings Disneyland would hold for me that weekend. Turned out that they might have learned from the stress of last year’s filming, and had split up the tasks between the weekend days. That Saturday, we would be able to cheer on young performers from local dance schools and, if lucky, we would catch a couple Disney Channel celebrities doing candid interstitials (those little segments where they say “Hi – this is what I’m promoting right now” or “See my face – I’m here as part of my contract!”). 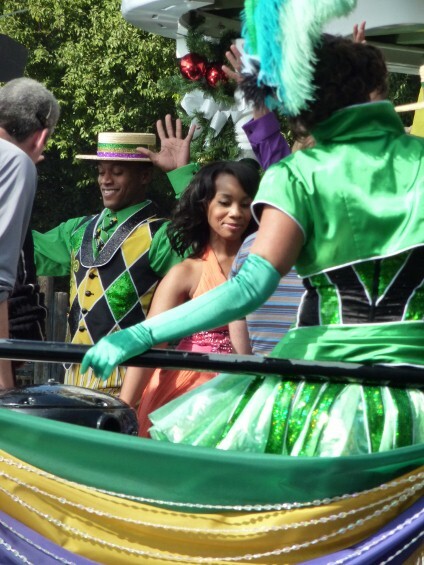 There were also tapings of the new “Tiana’s Showboat Jubilee” show, as it came out for the public. 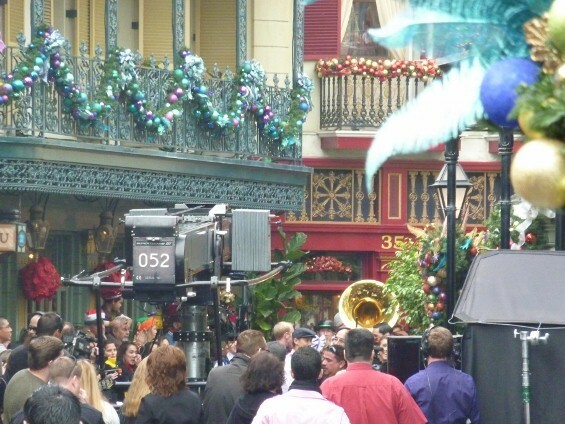 Of course, the most obvious of these was the dancer taping – right down “the middle of Main Street USA”, to quote the song. This was the only one we actually got to see happen. We heard rumors of the other things, but were never really told about them by Disney staff. When my fellow correspondent-in-crime, Tony Spittell, joined us, we immediately dragged him there to see the performance. Dancer taping is the equivalent of the biggest recital you could find. 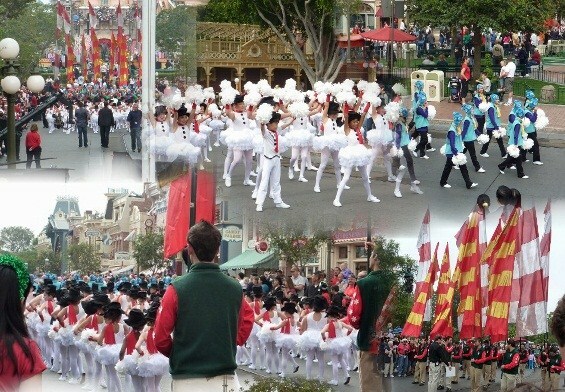 Dance schools from all over sign up to participate and provide Disney with several hundred performers. 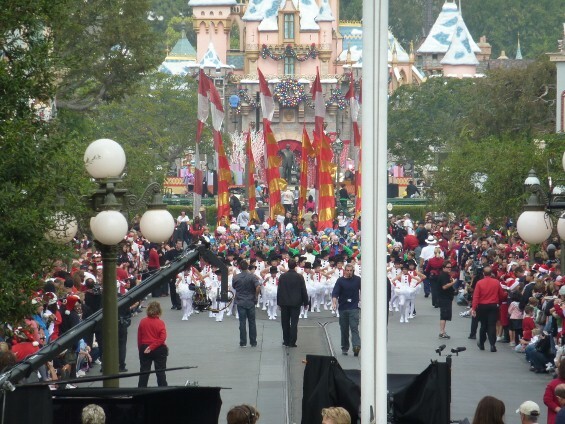 Disney supplies the teachers with the choreography and music and they begin to train the dancers. In years past, the dancers submitted their costume choice to Disney for approval, but according to one teacher I spoke with, this year’s costumes were pre-selected for ordering and were based on age group. Kids under 11 were done as snow-people and the older ones were in typical winter fleece attire. If you are game for witnessing this epic recital, there are a couple places to be. If you want to be filmed, the Main Street curb is your choice. The kids spend a lot of time going back and forth up the street. If you want an overall shot from up higher – similar to the long shots seen on the final show – go up the stairs to the train station. 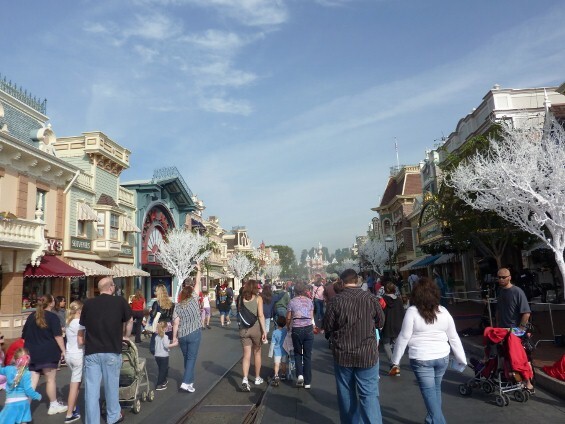 You can see everything on Main Street, as well as catch them coming around the bend of Town Square. We decided to try that perspective this year and it really was quite entertaining. 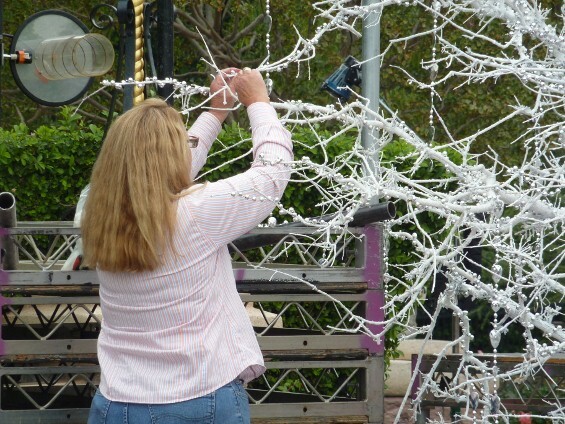 Zoe could see everything well (until she got bored…) – then she asked for a snowman costume…. Once we got our fill of watching those activities, we spent the rest of the day perusing the park. We never saw any sign of the Disney Channel celebrities that were in the park that day (Selena and Mitchell) – but then, we also didn’t have teens that follow them on Twitter… Had we been regular park guests, I think our day would have not even really been affected by the taping. Crowds were light and we were able to get on the more popular attractions within 10 to 20 minutes. Well, there was some bantering about with fellow line mates about the various rumors about who and what. Now I really don’t read the rumor websites at all. Maybe I should have. 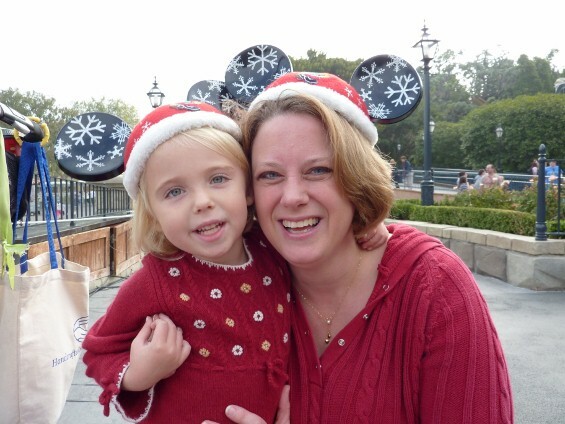 I was relying on what the Disney leads had dished me the day before and learned that I didn’t know it all. Bubble burst! When we entered the gates, there were no signs of the floats again! Rumors swirled and we found a pair of black-shirted film techs (grips, sound guys – they all look alike at a taping like this…) and asked them where to go. They pointed us straight to New Orleans Square. We arrived to a swirl of activity that blocked Royal Street from the public. Large boom cameras, light bounce screens, and a bevy of performers were preparing to whoop up a storm of activity. We had walked over with another family of young females that began to swoon loudly – it was professional dancer, Tony Dovolani from Dancing with the Stars! Turns out the woman in line was right – Dancing with the Stars folks! A little more waiting revealed he would be joined by crowd favorite, Cheryl Burke, his champion Dancing co-star. 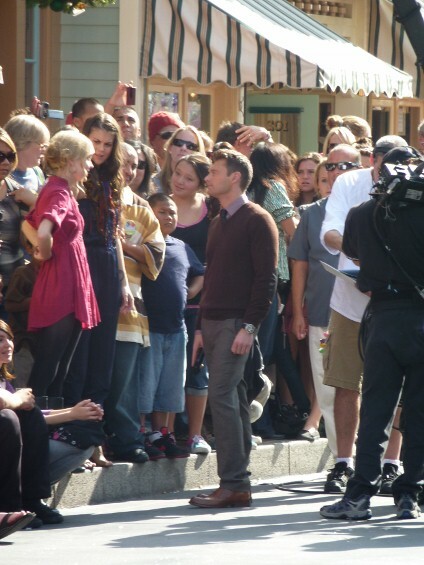 While they were getting ready, another segment began filming in the Square. 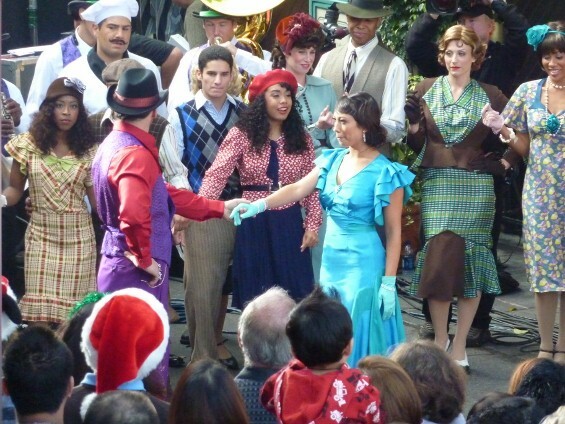 Princess Tiana had taken up residence on one of the Club 33 balconies and was performing a number with the help of the New Orleans Square musicians. 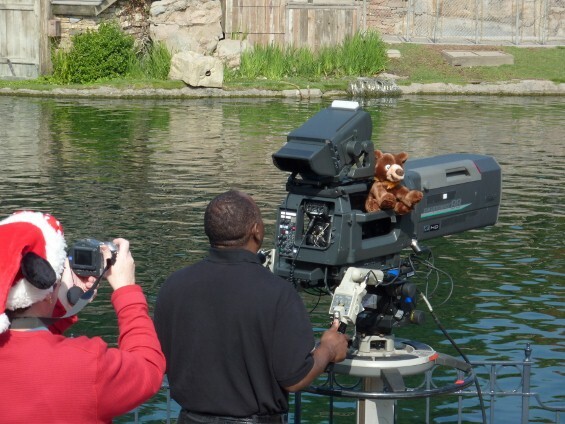 We decided to look for a good place to catch the rest of the filming, so we threw our blanket down and parked our stroller on the 2nd tier of the river/Fantasmic viewing area – right above the camera that was already in place. Ian and the girls left me for their adventures, so I amused myself by chatting with other parents and crew members. Now, before anyone gets rankled that I tossed my blanket and left – not so (at least not for more than 15-20 feet or so…) The area was seriously empty – and besides, The Swooning Girl Family had parked their stuff next to us, so we took turns manning the shop. The normal Sunday crowd hadn’t gotten that far back in the park yet. They were all on rides – after all, it was too chilly for Splash Mountain and Pirates was closed until filming was done in the Square. It was there that we met with the rest of our party – the Imigs from Nebraska and my occasional segment guest/photo assistant Chrysty Brood. The Imigs and I stayed close to the excitement – which allowed us some pretty great access to some video clips you can see below. Of course, the excitement quickly gave way to boredom and apathy. After all, how many time can you hear the same 5 stanzas of music repeated? I think they must have done at least 70 takes of Cheryl and Tony, from every possible angle imaginable. Of course, when doing all the waiting we did, we began to have a little fun – courtesy of one of the camera men, who was also waiting…. Just when we were about to give up and ditch the whole effort of seeing who the mystery celebrity would be on the showboat (rumors of Selena and Demi were brought to us by the Swooning Girl Family), we saw activity on the Mark Twain Riverboat. 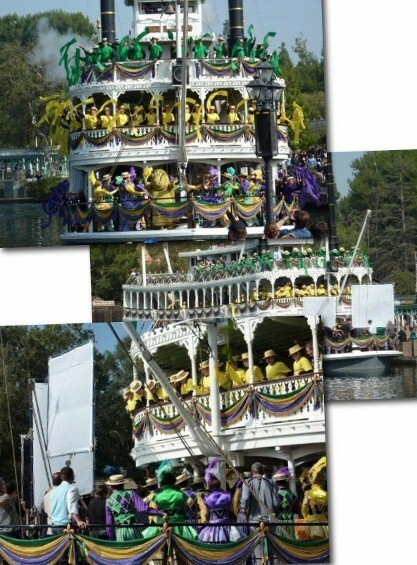 Of course – we had been promised it before – it teased us by starting to pull forward (and then driving backward to be reset), the kids on board had violently waved their streamers, even Louie the Alligator had be doing some fancy dancing. They even wheeled the giant boom camera to a spot in front of us and started to set it up! But this time, when it looked like it would make a pass for our buddy the cameraman – NO! Light reflector screens went up. They were filming some interior shots. That meant our celebrity was on board! We found out quickly that it was Anika Noni Rose – the voice of Princess Tiana and one of the stars of a little musical film called Dreamgirls. For this we abandoned our position to some mothers of showboat dancers and went to the Mark Twain Dock to see if I could get a good photo. Surprisingly, it wasn’t very crowded in that area. I caught a glimpse (and a snippet of video) of Ms. Rose, as she danced and sang to one of the most dynamic songs from the movie, “Down in New Orleans”. 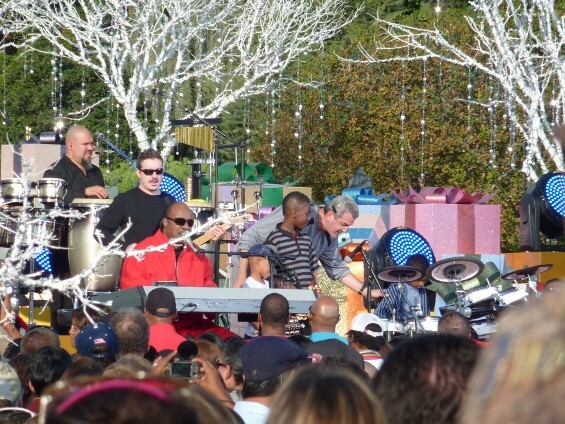 The final task for the day was getting a glimpse of the last celebrity performance in front of the castle – Stevie Wonder! This was the reason we had come back (although we had initially been told he would perform at 10:00 AM – not 2:00 PM! It was worth the wait. He performed a great song for the crowd, of which I was only able to capture a small snippet – thanks Mr. Pirate Hat Tall Guy! I got up extremely early and got ready to leave before the kids awoke. I am going to burn in hell for telling them that I was going to work early – heaven help me if they know I’m going to Disneyland without them. I arrived before the gates opened and the three of us entered the park to find the Host’s grandstand all set up and cameras down Main Street. This was what we were waiting for! Of course, in typical filming fashion, we were going to have to wait until 11:00 AM or so to start. 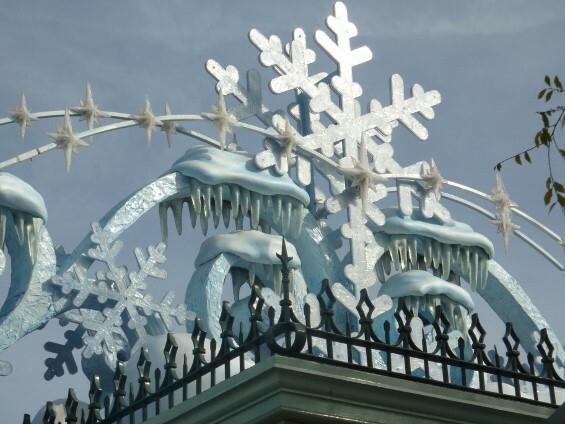 When the time came, we had a brilliant plan – eat lunch at the Carnation Cafe on Main Street. This was pure genius for a number of reasons. The park was fairly empty due to the fact that it was a Monday – the number of people actually there for the taping was incredibly small compared to the previous year. Add a lack of crowds, boredom of the audience (did I mention that taping is an incredibly slow process? ), and the prime real estate that the Carnation Cafe sits in, made it the perfect place to run out and capture a photo as the whim struck – and then run back to take a bite of my Meatloaf Stack Sandwich. First in the lineup was the USC Trojan Band. I chose not to photograph directly – mostly for fear of my UCLA fan friends retaliation, so I thought this was a more attractive display of the holiday spirit. 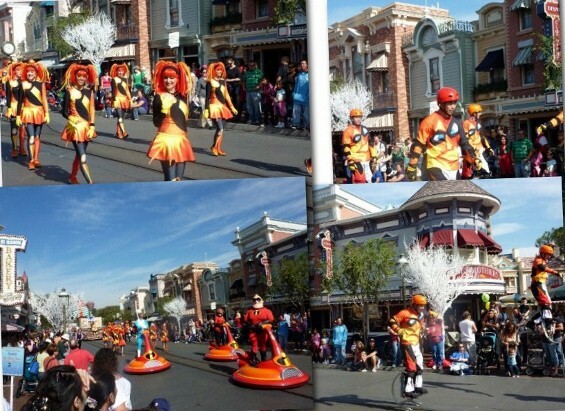 Next up were the movie floats and members of the Incredibles unit of the extremely popular Pixar Play Parade at Disney’s California Adventure. These were followed by the popular Skating Snowflakes, who – I have to say it – wheel about in quite the “flurry” of activity as they progress down Main Street. They were followed by some new faces and a lot of balloons (could it be that having a balloon in the Macy’s Thanksgiving Day Parade is inspiring them?). 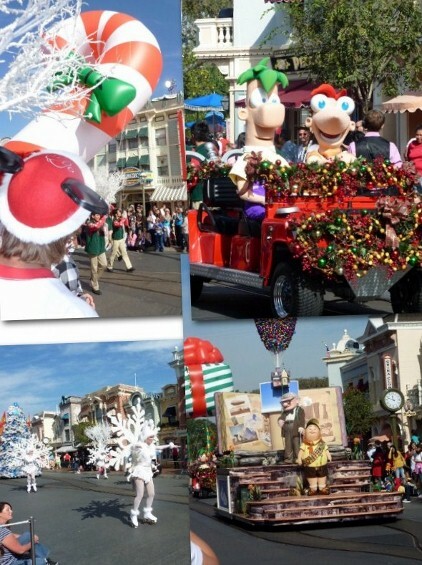 The cast of UP debuted on a new float and Phineas and Ferb proved that yes, they were a little young to be driving a motor vehicle down Main Street. After a few more floats passed by (I had to eat sometime), they were finally ready for the big performance of the day. After lunch, I managed to get myself a coveted spot on the Emporium corner and I settled in for the wait. 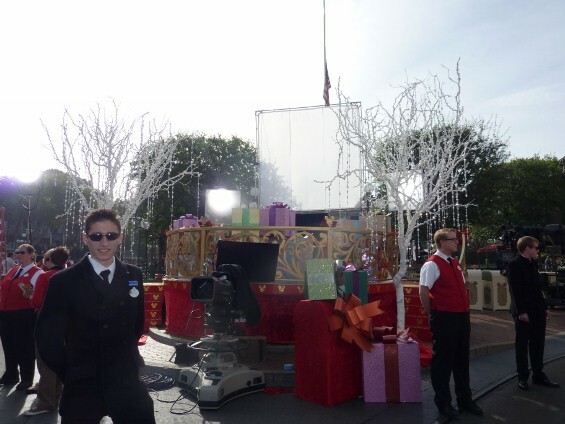 Now, Ryan Seacrest had been on Main Street, reprising his role as host again this year. He introduced floats, chatted with the crowd, and played with Disney characters. We even watched him record his departing lines and promote the Give a Day, Get a Disney Day volunteerism event. 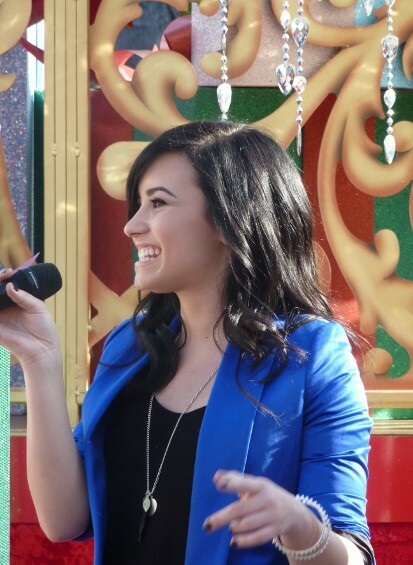 Now it was time to present to us today’s celebrity – Disney Channel star, Demi Lovato. Now I’ll be the first to tell you that I am not a Demi fan. I don’t have anything against her, but for me, my girls really aren’t old enough to know or be huge fans of hers and she is one of the temporary stable of young Disney girls. I was there to report on the parade and tell you about the performances and who was there. I have to say, I was impressed that she was very professional during the entire time I was there. She was interacting with the fans as her float came down the street and once she stepped off, she was all business. She took a spot beside the cameras and sang as her dancers went through their marks before filming. She appeared to be really enjoying the experience and she had a lovely voice. I was able to grab a little bit of video of her song – which I have been humming all week! I think I can truly say that hanging around Disneyland for the Christmas Parade taping has really put me into the holiday spirit! 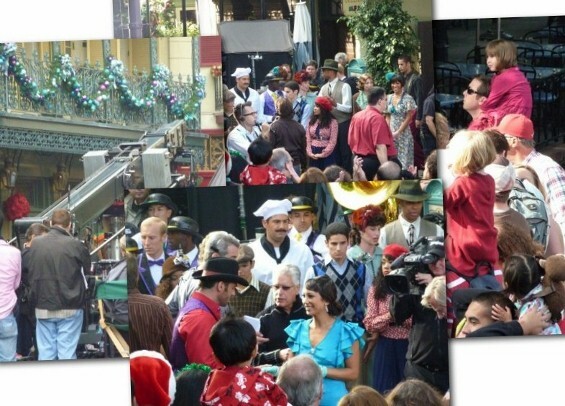 Click here to get a sneak peak of some of the parade taping action!